Z Depth, tool will travel with feed to Z-depth starting from R plane. 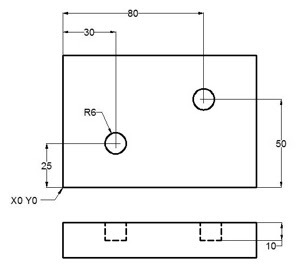 Once G81 drilling cycle is defined, the canned cycle is repeated at every X-Y position in sequential blocks. So G81 drilling cycle must be cancelled with G80. In the above example drilling will start with G81 drilling cycle at X10 Y30, so first drill will be at X10 Y30, then second at Y10, third at X30, fourth at Y30, fifth at X90 and the last one at Y10, because next block have G80 code, so drilling cycle will no more be repeated. 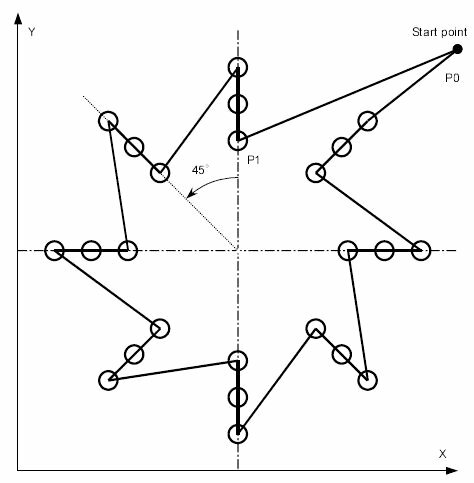 1- Rapid traverse to the specified x,y axis position (drilling position). 2- Rapid traverse to the R plane position. 3- Drilling with specified Feed from R-plane position to Z-depth position. 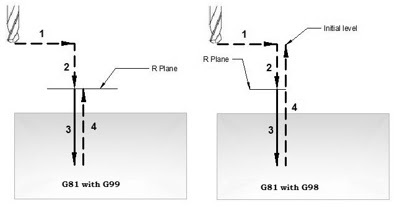 4- Rapid traverse to Initial level or R-plane depends on G98, G99 modes. After completing drilling depth the return is made with Rapid feed, the return height can be controlled through using G98 or G99. G99 Drill will return to R-plane. G98, G99 can be used multiple times during G81 drilling cycle. With G81 drilling cycle drilling operation can be repeated multiple times. The drilling is repeated K times when that parameter is given with G81 drilling cycle. Repeat drilling is normally used with G91 Incremental mode, and a good example of repeated drilling is Grid-plate drilling. 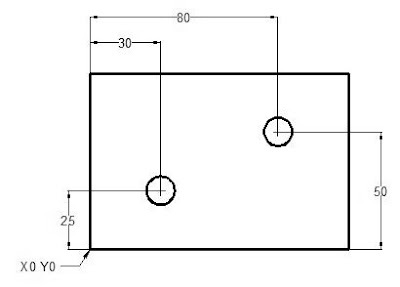 the example for repeat drilling is given below. G82 drilling cycle is also called G82 counter boring cycle. 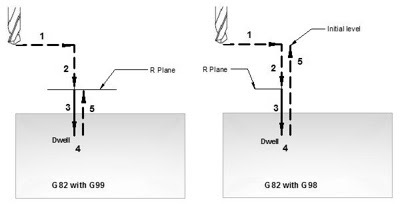 G82 is a normal drilling cycle the only difference is that it dwell for specified time at the bottom of the hole, normally used for accurate depth drilling. P Dwell at the bottom of hole. 3- Drilling with feed from R-plane to Z-depth position. 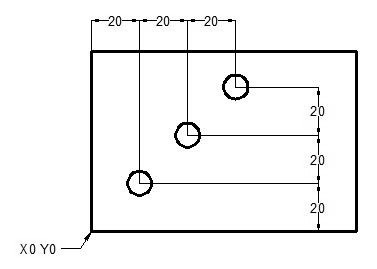 4- Dwell for specified time at hole bottom. 5- Rapid traverse to R-plane or Initial-level depends on G99, G98 mode. For a working example see G81 drilling cycle. 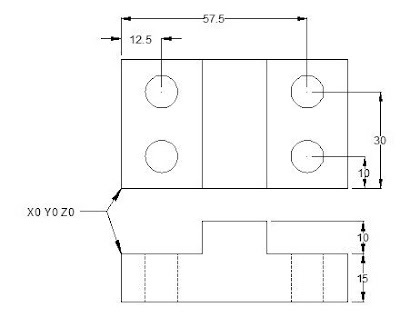 If K parameter value is given with G82 drilling cycle, then drilling will repeat the number of times given with K. An effective use of repeat drilling is while drilling multiple same distance holes, this way G82 cycle is used in G91 incremental mode. See G81 drilling cycle for repeat drilling example.